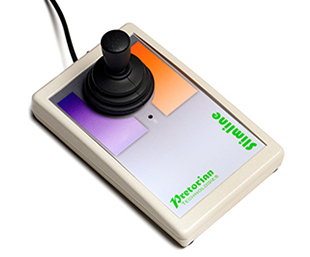 Perfect for smaller hands, the Slimline Joystick has both a small footprint and a low profile, allowing it to be used comfortably for extended periods by younger users. As with all Pretorian input devices, a high degree of programmability is built in. Four cursor speed settings allow the unit to be configured for the user’s precise needs. Each of the two touch sensitive buttons may be independently programmed to be left click, right click, double-click or drag-lock. All settings are saved in non-volatile memory and automatically recalled at power on. 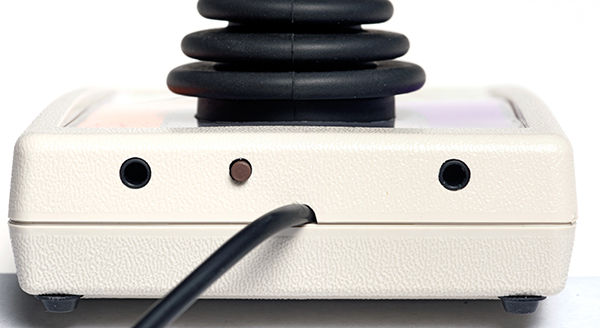 Two sockets allow external switches to replace the touch buttons where required. 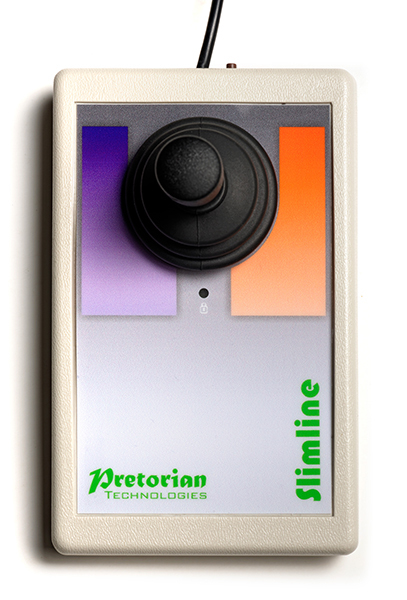 Includes audible feedback for the touch buttons, which may be turned off if not required. 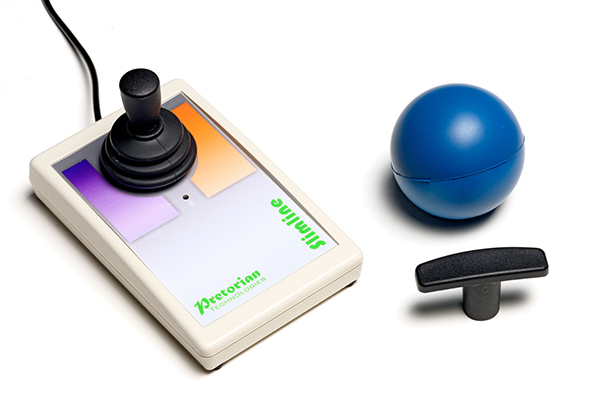 Although the touch buttons are a great benefit for many users who have little forearm strength and who have difficulty in pressing conventional buttons and switches they can, in some circumstances, be inconvenient- for example if the user needs to lean across them to access the joystick. For this reason they may be disabled on an individual basis simply by plugging any wired switch into the corresponding socket. Height of palm rest from desk 22mm. USB connection- compatible with PC, Mac, Chromebook and tablet devices that support external mice. Does not require any driver software to be loaded onto host computer- ideal for managed computer systems often used in schools. Speed settings and button functions retained if the unit is unplugged or powered down. Ships with T-bar handle and large diameter sponge ball. Dimensions 145 x 90 x 80mm.